Contacts Advice’s Contact Lens Website Price Index has been created to show which website has the best contact lens prices online. 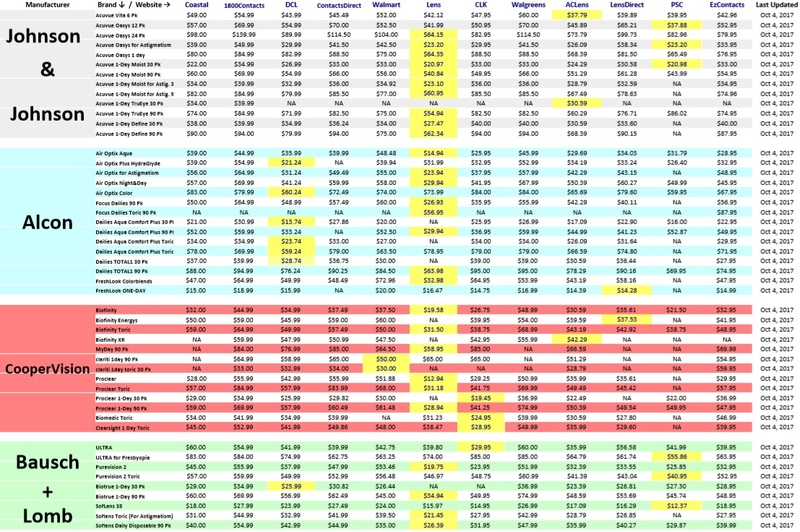 Since 2015, I have been comparing contact lens prices across all the major contact lens websites. What I learned is that there is no single best site for every brand. There are the sites that have the lowest price for a few brands, but over-charge for all other brands, and there are the sites that simply don’t have the lowest price for any brand. It is impossible to point to a single site that offers the best contact lens prices online for every single brand. Nevertheless, I think it is useful for contact lens consumers to know where they are most likely to find the best price for their contact lenses. That is why I have developed Contacts Advice’s Contact Lens Website Price Index. Contacts Advice’s Contact Lens Website Price Index compares all the top contact lens websites to each other and assigns each website a number which represents how good that website’s prices are on average. The idea behind the calculations was to add up the price of every contact lens brand for each website and compare the totals to each other. By comparing the totals of every website, we can get an idea of how much they all charge relative to each other. However, this cannot easily be done as some websites sell certain brands that other websites don’t sell. The brands that are not sold on every single website would skew the results unfairly in the comparison. Once I calculated the combined price of every single brand at each of the websites listed above, I divided every site total by the total of the site with the lowest one. This results in the website with the lowest average prices having an index of 1. Every other site has an index higher than 1, and the higher the index, the higher the prices are on average for that site. You can look at the index number for any site as the number of times more expensive they are on average compared to the website with the lowest average prices. For example, if a website has an index of 1.2, their prices are on average 1.2X higher than the site with an index of 1. If the index is 1.5, the prices are on average 1.5X as high as the site with lowest prices, an index of 2 would mean 2X higher, and so on. The figures used to calculate the following chart were all taken from the price checks I performed on October 4th, 2017. 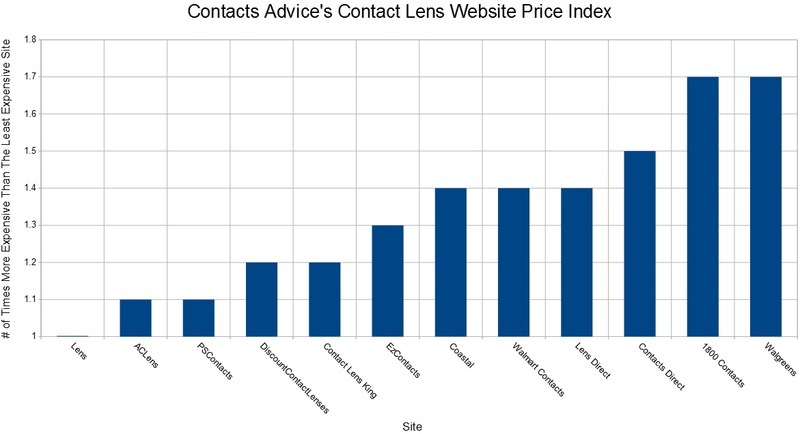 As you can see from the chart above, Lens.com is the contact lens website that has the lowest overall price index, meaning that the best contact lens prices online are the most likely to be found at that website. ACLens and PSContacts also have pretty good prices, averaging about 1.1X more expensive than Lens.com. 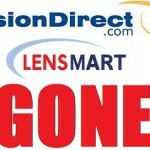 Discount Contact Lenses and Contact Lens King would be the next 2 best bests averaging around 1.2X more expensive than Lens.com. 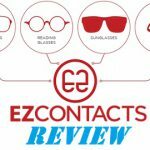 EzContacts, Coastal, Walmart Contacts and Lens Direct are all about mid-ranged, averaging between 1.3 – 1.4X more expensive than Lens.com. 1800 Contacts and Walgreens are the worst websites to buy contact lenses from. On average, they are 1.7X more expensive than Lens.com. Contacts Advice’s Contact Lens Website Price Index does not give you any information about the price for any one specific brand. If you are looking for the site that has the lowest price for your brand of contact lenses, consult Contacts Advice’s Contact Lens Price Comparison Chart on Contacts Advice’s homepage. It is possible that the website with the index of 1 is NOT the website that has the lowest price for your brand, and vice versa. A website with an index of 2 COULD have the lowest price for your brand, it’s just not as likely. But the only way to know is to check. 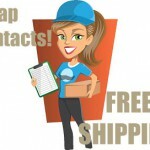 Contacts Advice’s Contact Lens Website Price Index also does not take into account shipping costs and processing fees. Some websites charge these fees while others don’t. This could play a small role in the overall results. What Contacts Advice’s Contact Lens Website Price Index does tell you is which site has the best contact lens prices online overall. I created this Index because there is a perception among many contact lens wearers that the prices for contact lenses online are all the same. This index shows, in as clear a way as possible, that contact lens websites not only have different prices, but vastly different prices in many cases. For example, one of the most common misconceptions among contact lens wearers is that 1-800 Contacts offers really low prices on contact lenses. You can see from the graph above that in reality, 1-800 Contacts is the most expensive place to buy contact lenses online. I would recommend that anyone who purchases contact lenses online, or is considering doing so consult the graph of my Contact Lens Website Price Index. If the site they have traditionally purchased their contact lenses from (or is considering ordering from) isn’t among those with the lowest index, I would advise considering switching sites. To make sure you always get the lowest price for your brand of contact lenses, always consult Contacts Advice’s Contact Lens Price Comparison chart on Contacts Advice’s homepage. I perform price checks from over 50 brands across 12 different websites every week to make sure I uncover where the lowest price for every brand can be found.